That’s right, mis amigos. Chiles Rellenos. If you read my post on Shredded Chicken Enchiladas, you probably know I tend to shy away from making Mexican food at home. Why? I guess it’s because I just prefer it to be made by the experts. Oh — and Dustin doesn’t tend to like much Mexican food — so, there’s that too. However, that doesn’t mean I don’t yearn for some delicious homemade Mexican food…in my home. So, when our CSA gave us — yet another — bag of beautiful Anaheim chiles for the third straight week, I figured something had to be done. And, really, what better way for Anaheim chiles to meet their full potential than as chiles rellenos, right? I mean, c’mon! Before we go any further, I have a confession to make: this was my first attempt at making chiles rellenos. Kinda hard to believe when they’re one of my top favorite Mexican comfort foods, huh? I know…your minds are all blown by this revelation. I’m sorry. I have to admit: I was a bit nervous to try my hand at making them. They look so complicated…and, well, stuffed. I always figured it was tons of work to perfect. Again, another reason I’ve avoided them in the past. The result? Perfectly delicious. Crunchy, yet fluffy, exterior. Delicate, cheesy and tender chile interior. So. Good. And not too much work. Yes, they do require some love…but they’ll pay you back double. Plus, the special chile relleno sauce I made as an accompaniment will likely have you wanting to lick your plate to get every last drop. Okay, maybe that’s just me. And, no, I didn’t lick my plate…but I thought about it. Perfectly delicious Chiles Rellenos. Crunchy, yet fluffy. Delicate, cheesy and tender chile interior. 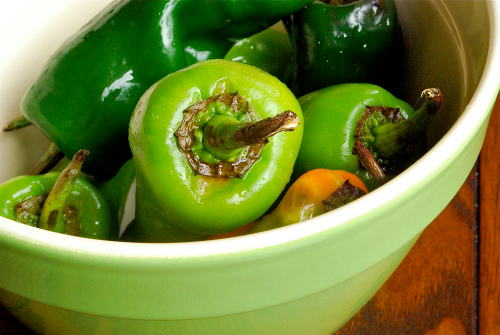 Plus a recipe for awesome chile relleno sauce. There are several ways to peel a chile pepper: (1) place about six inches beneath the broiler on a baking sheet, (2) place on an outdoor grill or (3) place on top of a gas stove (my method -- though be sure to have ventilation 'cuz it can get a bit smoky). Any way you choose, use tongs to turn the chile peppers as they darken. The idea is to burn as much of the peel/skin as possible. 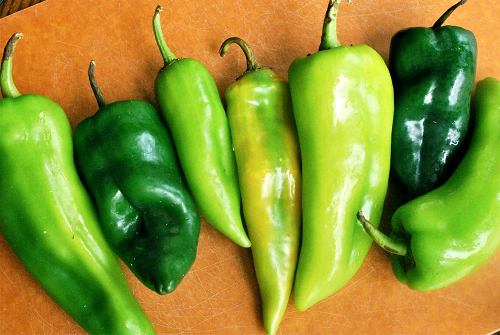 Keep a close eye on the chiles as they may go from blistered to burnt very quickly. Once the skin is fully charred, place the hot chiles into a Ziploc bag and seal. Set aside for several minutes. The steam within the bag will help with removal of the skin. Once the chiles are cool enough to touch, carefully make one slit up the side of each chile, keeping the stem intact. 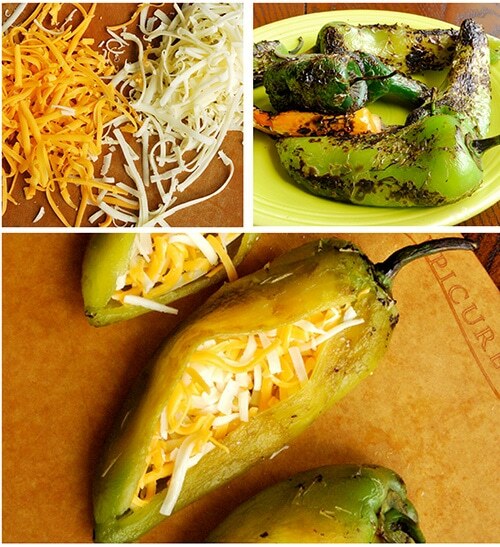 Gently remove the seeds and membranes from the peppers. Gently stuff each chile with a combination of grated cheddar and Monterrey jack cheese until you're just able to close at the slit comfortably. If the chile is refusing to stay together, you can try using a toothpick, but I found it unnecessary. Whip the egg whites by hand or with an electric mixer until stiff. Set aside. Combine milk, 1/2 cup flour, egg yolks, baking powder, baking soda, kosher salt and 1/2 tsp. olive oil in a deep large bowl. Gently fold in the egg whites until just mixed. Pour equal amounts olive oil and vegetable/canola oil to reach 1/4-inch depth in a large, deep skillet. Heat oil to medium-high. In a shallow bowl, spread out 1/4 cup flour. Roll each stuffed chile in the flour and gently shake off all excess flour. Dip chile into batter, holding the chile by its stem. Cover the chile as much as possible with the batter up to the stem, but leave the stem uncovered. The stem will be your holding/flipping device. Quickly transfer to hot skillet. Cook each chile until lightly browned on both sides. Transfer to a plate lined with paper towels until ready to serve. 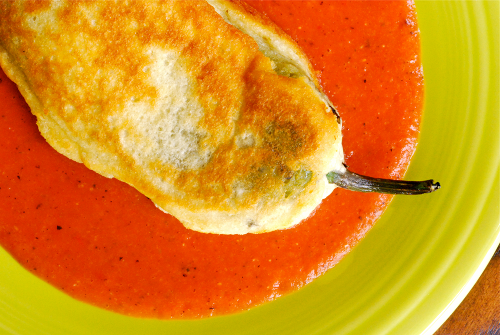 Serve quickly if possible, and with some chile relleno sauce (see below for recipe). Heat oil in medium-large sauce pan over medium heat. Add onion and cook until sweating, about 5-8 minutes. Add kosher salt, pepper and garlic and cook for an additional 2 minutes, stirring occasionally. Add flour, tomatoes and oregano and cook until thickened, about 5-8 minutes. Add stock and bay leaf and bring to a boiling, cooking for about 10 minutes. Remove bay leaf and discard. Using a stick blender, blender or food processor, puree the sauce until smooth. Serve with chiles rellenos. Fantastic! Mmm! Took me a lot longer than the predicted time, but was happy hubby helped with the batter while I peeled the Anaheims! I tried this recipe tonight and it’s now my favorite! This is exactly the sauce I was looking for, I can’t wait to try this! I love chile rellenos! I have aquestion? Do I have to broil the chilies.Can I just stuff and cook? Try some of the chicken from your enchildas in these. Have you ever had these at Chuy’s? OMG Delicious! restaurants…congrats, you’ve got the authentic recipe!!! SO YUMMY-GOOD!!! Thanks for the recipe. My husband and I made this for my Mother’s Day dinner and loved it! Yum! Love chiles rellenos! I’ve never attempted to make them myself though. I’ll have to give your recipe a try. Thanks, Priya! Welcome to my blog — I’ll make my way over to your as well! Oooooo… these are one of my all-time favorite foods. And cheese-filled is the best. I could eat them until I get sick. And yes…I would have TOTALLY licked the plate. Yours look divine. So yummy…so very, very yummy. I want one right now! Couldn’t agree with you more, Jeanne. Thanks! Lacey I clicked on this right before leaving for the store, and I’m so so happy that I did, because I’m making these. They’ve been one of my favorite dishes to eat but I’ve never made them and you’ve motivated me to try. This recipe looks scrumptious, and it doesn’t seem that difficult. thanks for including the photos, it helps. I have everything but the Anaheims. oh yum. Yay, Miss Becky! I hope you like the chiles rellenos. They are a tad more work than normal, but definitely worth it. So yummy. I’d love to know what you think.